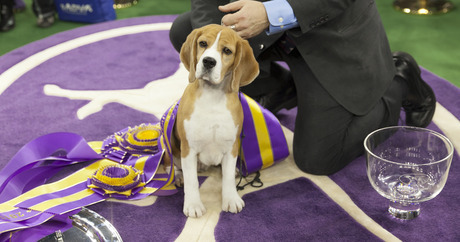 Miss P, the grandniece of Uno (the first Beagle to win Best in Show at the Westminster Dog Show in 2008), took the prestigious prize last night. Her full name is Ch Tashtins Looking for Trouble. She beat out winners from six other categories. The finalists for Best in Show competing against Miss P were: Swagger (Old English sheepdog), Rocket (Shih Tzu), Matisse (Portuguese Water Dog), Liz (English Springer Spaniel), and Flame (Poodle). Many thought Swagger, a favorite of the crowd, was expected to win. Matisse is the cousin of President Obama’s dog, Sunny. For the third time in a row, Matisse won in the Work Group category. Miss P also took the prize from Rocket, the Shih Tzu co-owned by kidnapped heiress Patty Hearst. Rocket won in the Toy Group category. 8 in. Class: Pink Papillon 37.00 Attleboro, Mass. 16 in. Class: Smart Border Collie 31.21 Simi Valley, Calif.
20 in. Class: Tex Border Collie 30.93 Long Valley, N.J.
24 in Class: Ffynch Border Collie 33.95 Somers, Conn.
Best All American: Roo! All American 35.66 Menlo Park, Calif. Overall winner: Tex Border Collie 30.93 Long Valley, N.J.
More than 50 trophies went home to dogs in numerous categories. For the full list, visit The Westminster Kennel Club.